For a while now, sensors are not only a matter of process control – today one of their primary tasks is to link processes together. With its extensive range of Safety@work products, Leuze electronic optimizes collaboration between man and machine: sensor and control systems, like those of the RSL 400 safety laser scanner, can be integrated intelligently into the processes performed by machines and safeguard these machines in a reliable and tamperproof manner. At the same time, the processes are structured efficiently and cost-effectively. In machining centers, parts of various materials are machined, turned, and drilled. The prerequisite for processing work pieces in complex machining centers with a high degree of precision is having the right tool available for each work step. In addition to checking whether the tool is present and identifying it, the drill or milling cutter must also be monitored for tool breakage. Inductive switches or camera-based code readers clearly identify whether the correct tool is mounted for the respective processing step. Focused laser photoelectric sensors can – thanks to their very small light spot – reliably check whether even the smallest drills or milling cutters are intact. Industrial robots, which can perform a large number of swivel and gripping movements in a very short period of time, are often used for automated loading and unloading of machine tools. Their movement zones must be reliably protected against access over a large area. Before a robot picks up a part, the part must be uniquely identified to ensure that the correct processing step is carried out. This is done using the DCR 200i camera-based code reader. The DCR 200i is a reader used to detect and identify Data Matrix codes. The fast imager, integrated high-performance LED illumination, as well as high resolution in combination with a very high depth of field guarantee reliable decoding, even with fast processes and high object speeds. Safety laser scanners such as the RSL 400 from Leuze electronic are used for the safety-related monitoring of areas in and around machines and systems. 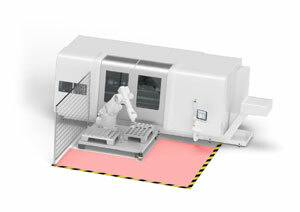 A maximum operating range, robust operation and simple handling are crucial here. The simultaneous monitoring of four protective fields means the working area can be split up and the speed safely reduced. In future, an important aspect in addition to the automated loading and unloading of machine tools will above all be the linking together of multiple machine tools in combination with automated production processes. This includes, for example, storage systems that optimize material flow, but also a wide variety of transport equipment such as linear gantries, pallet handling systems and conveyor systems, which all increase the level of automation considerably. For the safeguarding of large access points, safety laser scanners with vertical alignment of the protective field are used, e.g. to detect vehicles and persons. A further option is safeguarding using multiple light beam safety devices. These devices provide a greater operating range and therefore an efficient solution for safeguarding access points over long distances of up to 70 meters – even "around the corner" solutions with multiple mirror columns are possible. Intelligent products such as the MLD 500 safety light curtain have an integrated laser alignment aid for time-saving and cost-effective alignment. Simple configuration by means of wiring and integrated indicator lights for status display are possible, even over long distances. Different safeguarding options are available depending on the respective requirements and application. A comprehensive range of products helps in choosing the best possible solutions to ensure safety at work and also in optimizing collaboration between man and machine. An AGV, which moves autonomously and flexibly in space, transports blanks into the working area of the robot or machine tool. On completion of the production process, the machined work pieces are collected again. The transportation path of the AGVs must be safeguarded with safety sensors which monitor the presence of persons and objects. An important consideration here is the flexible adaptation of the protective fields to the movement situation and the different loads. In the case of the triangulation principle, an AGV must be equipped with two different scanners. Unlike the contour navigation principle, just one scanner is needed for safeguarding and navigation. This means that safeguarding and data capture for navigation requires one single safety laser scanner. In other words, the scanner simultaneously also provides the measurement data needed for navigation. In addition to that, the measurement values have an extremely high angular resolution and accuracy. This is important to precisely determine the position of the AGV. The RSL 400 safety laser scanner enables such a combined solution. The safety laser scanner is available in various models. The extensive range of scanners from Leuze electronic includes a total of nine functional variants – three of which with data output for AGV navigation. All variants are available for the four operating ranges of 3.0, 4.5, 6.25, and 8.25 meters. Models with PROFIsafe/PROFINET interfaces are also available.